Item shown above : Natural Hardwood - Oak Finish (Helmets not included). This solid furniture grade beech hardwood case features a UV protected acrylic front panel for keeping out dust and 4 shelves for displaying 32 Riddell Pocket Pros mini helmets. The front panel is slide in from the side. This case is prefect for displaying a full set of team helmets, all 32 teams and the case is even partitioned so that you can face against the 16 teams from each league. Wall brackets already on the back for hanging. You may also stand this on counter top. Back of the cabinet is lined with a lovely felt to give contrast to your displayed helmets. (pocket pro helmets shown are not included.) 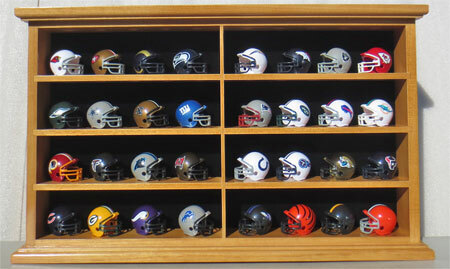 This cabinet is for displaying Riddell pocket pros scale football and baseball mini helmets. Exterior: 13"H X 21.5"W X 3"D, Interior depth : 2" . Shelf Height: 2.5"